Louis Poulsen Wins iF Gold Award and iF Design Award 2018! At the official award ceremony at BMW Welt in Munich last night, Louis Poulsen won two iF Design Awards 2018. The iF Design Award is presented annually by Hannover-based iF International Forum Design GmbH, the world’s oldest independent design organisation. 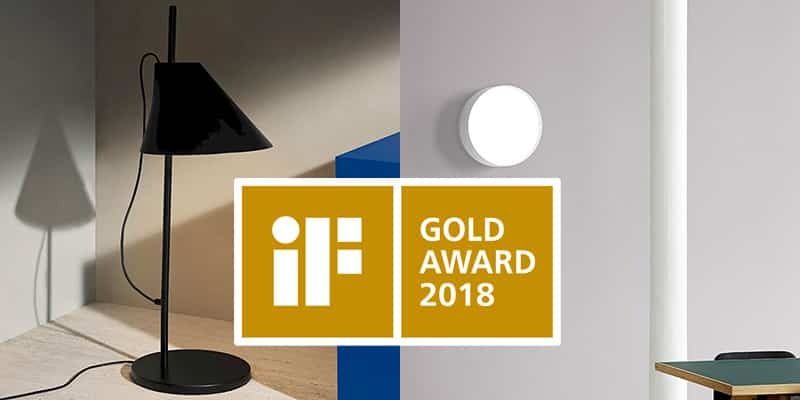 The Yuh lamp, designed by GamFratesi, took home the prestigious iF Gold Award in the Product discipline in the Lighting category. The design won over the 63 members of the jury, which was made up of independent experts from around the world. Competition was fierce: over 6,400 entries from 54 countries were submitted for the coveted seal of design excellence. With their new Yuh table, floor and wall lamps, launched last year, Danish design duo GamFratesi joined the ranks of illustrious designers and architects who have created lighting products for Louis Poulsen. One of Yuh’s essential features is that it is personal. Designed to be flexible and take up very little space, the lamp rotates, rises and drops, illuminating and creating ambience in the required area. In other words, a lamp created around you. The LP Slim Round, a new family of light fixtures designed and developed by Louis Poulsen, won the second iF award. With its broad palette of product options, the LP Slim Round allows a single aesthetic to be applied across different functional requirements. The sleek and distinctive design makes it possible to give each room its own identity – while retaining a unifiedoverall look. More information about the winning products can be found in the Design Excellence section of the iF WORLD DESIGN GUIDE. For 65 years, the iF Design Award has been recognised as an arbiter of quality for exceptional design. The iF label is renowned worldwide for outstanding design services, and the iF Design Award is one of the most important design prizes in the world. Submissions are awarded in the following disciplines: Product, Packaging, Communication and Service Design/UX, Architecture and Interior Architecture as well as Professional Concept. All winning entries are featured on the iF WORLD DESIGN GUIDE and in the iF design app, and are on display at the iF design exhibition Hamburg.